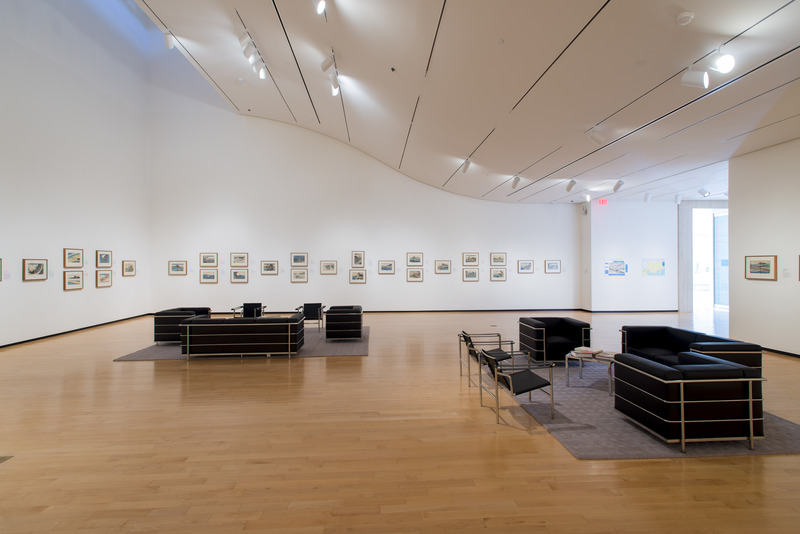 Based on the exhibitions featured at the museum during the 2015-2016 academic year and works from the permanent collection, students submitted written work responding to individual pieces of art experienced first-hand at JCSM. Entry was open to graduate and undergraduate students. 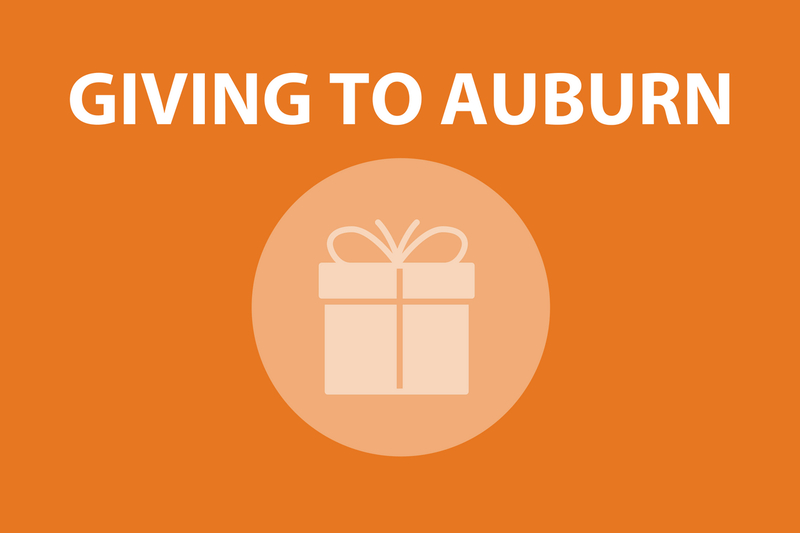 Prizes of $500 were awarded for two academic essays and two creative submissions. For information on the writing competition for the 2016-2017 academic year, contact Scott Bishop at 334-844-7014. 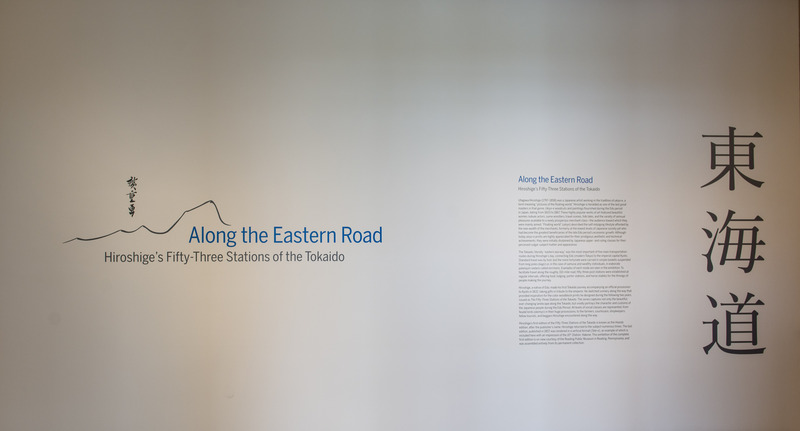 Last fall in the Harbert Gallery of the Jule Collins Smith Museum of Art, there was an exhibit titled Along the Eastern Road: Hiroshige’s Fifty-Three Stations of the Tokaido created by Utagawa Hiroshige. It contained fifty-five images representing different posts along the Tokaido road, the road between the starting and ending cities of Edo and Kyoto, respectively. Hiroshige recreated these through woodblock prints, which were most often used to create images of ukiyoe or images of the floating world. These images are slightly taxing and impenetrable at first because they all appear to be very monotonous; many have similar subjects and backgrounds, and it took a while before I began to notice differences in the pieces. However, after I spent a bit of time in the gallery, I gradually allowed my mind to be freed into the “floating world” rendered in these images. I came to realize that each individual print has a distinct reason why it was created besides just being a stop on the road—they all share something about the journey, Japanese culture, woodblock prints, or about Hiroshige himself, and just as any other form of art, they are a connection between the past, present, and future. Generally the Tokaido road was used for transportation or travel with priests, tourists, traders, and people on religious pilgrimages stopping along the way to turn onto intersecting roads, rest, or make purchases at local shops. Most citizens traveled the 310 mile long journey from Edo to Kyoto by foot, but the rich were able to go by kago, being carried in a cloth basket hung from long poles. The journey could take anywhere from a week if rushing to a month if the weather was bad, with each station serving as a rest stop where the travelers could sleep, shop, or refuel. Hiroshige travelled the road in 1832, stopping at each station to sketch the area that he would later use to make these woodblock prints. 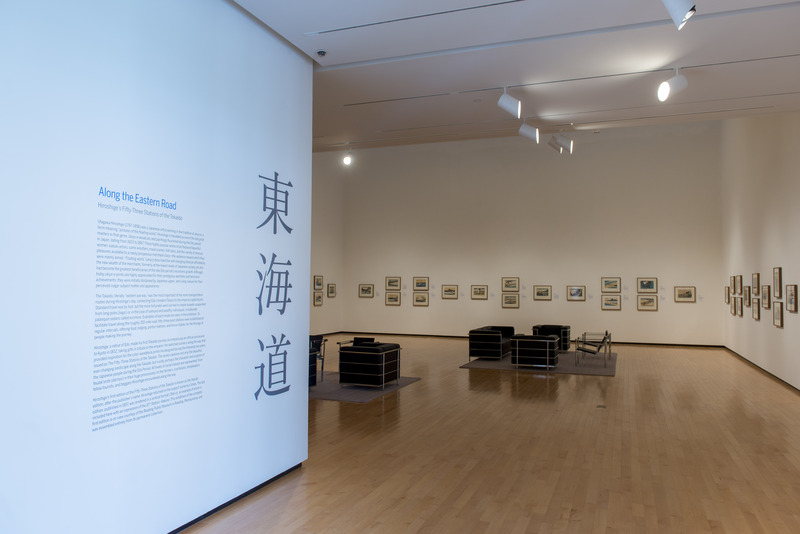 To highlight different aspects of the journey, he constructed multiple versions of the prints; the exhibit at the Jule Collins Smiths Museum displayed the first edition known as Hoeido (after the publisher), and included one image from the final edition, seen at station ten. These works and others Japanese prints later inspired modern artists like Monet and Van Gogh. The Harbert Gallery in which the exhibit was displayed is an open, quiet, and slightly dim room with a ceiling that rolls upwards, comparable to a wave. I realize that the architecture of the room is permanent and does not change by exhibit, but I could not help contemplating that it resembles a well-known wave from another Japanese woodblock print—”The Great Wave off Kanagawa.” This gave the sensation as if I too were in the floating world of a Japanese print. In the center of the gallery were two groupings of black leather love seats to relax in and enjoy the exhibit. I appreciated these because as I was viewing the pieces, I began to feel weary just as a traveler might; it was evident that the gallery sought to imitate that atmosphere of a journey. Immediately across from the entrance to the gallery was text describing the display with the title repeated adjacent in Japanese characters. These served as a reception to welcome the viewer inside the gallery and modify their mindset and expectations to one of a different culture. There were also some examples of woodblock prints from the museums’ permanent collection, an explanation of how these prints are made and how they represent a “floating world”, and a map of the Tokaido Road, showing where each station is in Japan. From there, you start your journey along the road just as a traveler would—starting at the take-off point in Edo and voyaging around the room, viewing each station independently until you finally reach Kyoto at the end. This is likely how Hiroshige meant for it to be portrayed so that the viewer, himself, and the figures in his images would all be going on the journey together. 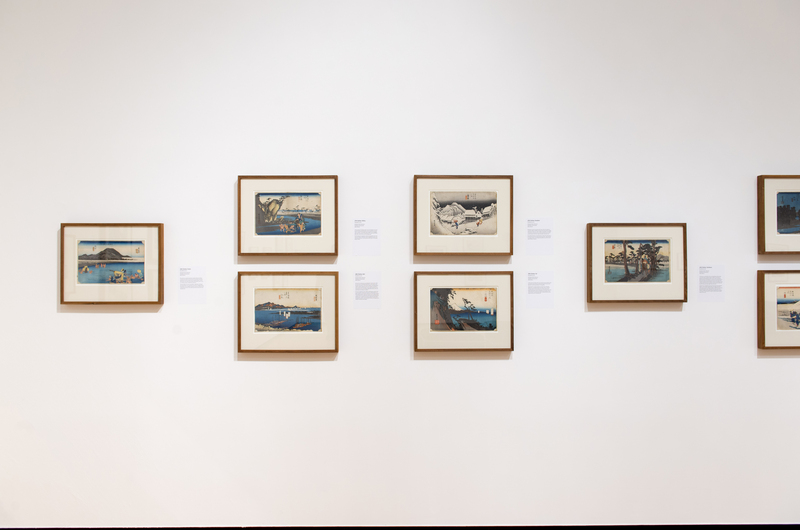 The works are arranged counter-clockwise, with the first starting on the gallery’s righthand wall and traveling around the room until reaching the end at the other side of the room. This was intriguing to me because in addition to the Japanese symbols and other anti-Western cultural aspects, I was traveling and seeing these images in a way that contrasted what I was used to: right to left rather than left to right. Portions of the Japanese culture and other Asian cultures have a way of thinking about time and other philosophical concepts that is circular rather than linear, being more focused on balance over truth. Thus, it is fascinating that the works were presented in way a that mimic this manner of thought, working as an intentional method to break down our Western mindset and engage us further in a new culture. Also reinforcing this idea was the fact that there was not enough room in the gallery for all fifty-five images to be hung side by side, so some were stacked on top of each other, alternating between one image and a grouping of images. I believe this to also be intentional because it seemed that if the exhibit designer could have easily used an adjoining room to expand the exhibit so that all images could be hung singly. This presentation causes you to have to move your head up and down to view all the prints, further strengthening the idea of a journey as well as blocking our traditional way of reading straight across; viewing the pieces is now an experience rather than just an observation. Also, just as the travelers would not stop at every station as there were fifty-three stations for a trip made in about two weeks, we should not stop at every image. To more closely analyze the exhibit and force myself to learn to recognize differences between the prints, I chose to study three images that particularly stood out to me during my journey: stations fourteen through sixteen. They gave the impression of significance because they all appear to be a shift from reality, stylizations of the stations they embody and brief departures from the realism of the previous and subsequent scenes. The first shift is the revision of the geography at station fourteen—subtle but crucial. 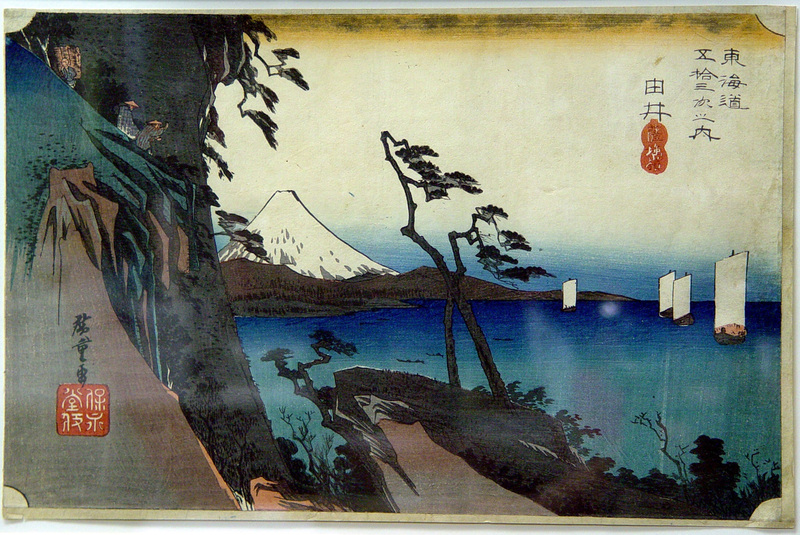 The stop at Yoshiwara was commonly know as “Fuji to the Left” because up until this point, the mountain had always been seen on the travelers’ right. As they passed this station, the road curves and they pass Mt. Fuji, a significant landmark that lets the travelers know just how far they have come and provides hope that they are making progress towards their final destination. Staying with the terrestrial adjustments, station fifteen brings a seemingly unnecessary climate shift. A snowy mountain scene is presented in an area with a typically warm climate; in fact, the label next to the image says that snowfall is “extremely rare.” Station sixteen produces the final shift: also know as Yui, this station shows some travelers going over Satta-Toge Pass. Its’ view was considered the most beautiful of the entire highway but also the most treacherous, causing travelers to focus intently on passingly safely and prohibiting them from enjoying the view. Obviously these images were placed together because they are a chronological part of the journey, and it is important to note that they were not the only images in the exhibit that depicted separations from the actual station. However, these three were the first of the exhibit to do so, likely because this shift in representation was done to parallel a shift in the mind state of the travelers. All three of these stations are evidently more treacherous than the previous stations—a thin ocean pathway, a trek through snow (although not accurate), and a particularly dangerous mountain path. The excitement of the journey is now wearing off and the travelers are becoming aware that the trip is getting harder. While I was in the exhibit, taking notes and enjoying my encounter with an unfamiliar culture, a few different groups of people came through, including a father with three kids, an older couple, and a single girl by herself. All of these groups entered and saw what the exhibit was on, looked intently at the woodblock prints on the left wall, glanced at the introduction but did not bother to stop and read it. They then hurried to look at the first couple of images and begin their journey only to stop and make their way to the next gallery. Not a single group made it around the entire sequence as intended. Was this similar to something people commonly did on the road—begin their journey but find themselves unable to finish? To answer this question for myself, Japanese art is not something I am incredibly familiar with. Because of the monotony of the images, I believe that people did not feel it was worth their time to view all fifty-five, especially if you do not have a background in the study of Japanese art or art at all for that matter. However, as I came to realize throughout my studies and writing, this form of art and the understanding of a new society that comes with it was incredibly gratifying. It takes a bit more application to break down the walls separating the cultures, but the view from the other side is far worth the effort.